The first base position has become a tricky one for the Mets this week. With the demotion of Ike Davis to AAA, it has left a void with no one player standing out to take the job. Terry Collins announced prior to last night’s game that Daniel Murphy would play first against right handed starters while Josh Satin will likely get the start against lefties. I am one of the many fans out there who is strongly against moving Daniel Murphy back and forth between the two positions. Murphy has spent the last several seasons bouncing around without a true position and seems to have finally established himself as an everyday second baseman this year. There has never been any doubt that Murphy can hit, he has been one of the few bright spot in this line up, the question has always been his defense. It took a few seasons, and injuries along the way, but he has finally looked comfortable at second base. Murphy has that “team first” attitude, which is why he is a fan favorite, he has always done what the team has asked of him, playing/hitting anywhere he is asked too. There is nothing wrong with that, in fact I love it, but the Mets should not be messing around with him like this as he has finally settled into a position. I realize this move may only be temporary, as the Mets do not view Murphy as the first baseman of the future. What has me concerned is that the Mets are making this move in an attempt to get a better look at Jordanny Valdespin at second base. I am all for Valdespin getting more playing time in an attempt to see what he is fully capable of, just not at second base. With the amount of holes that this team has in the outfield, I would like to see him get a real look out there without getting every other day off, rather than back at second base. There are two positions that I would say many of us feel confident about going forward, David Wright at third and Daniel Murphy at second. Why mess with one of the few good things this team has going for them? The combination of Josh Satin and Justin Turner being the others to split time at first base does not do much for me or anyone else for that matter. Neither one of them will amount into a starter for this team, which would accomplish little in what is a rebuilding year. 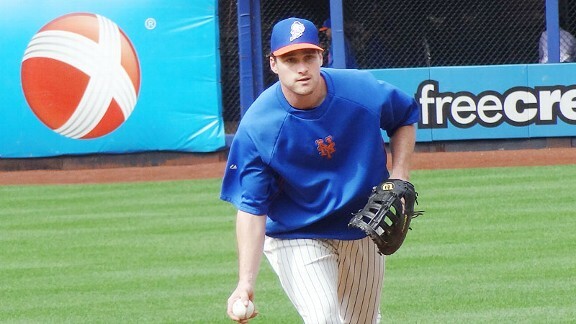 The only player I would like to see play some first base while Ike is in the minors is Lucas Duda. First base is his natural position and he has clearly shown he will never amount to much of a defensive outfielder. I know the front office is trying to get him accustomed to the outfield as much as possible, but why not put him at first? Maybe being back in his natural spot will ease his mind and help him improve at the plate. The front office and fans a like remain hopefully that Ike can return to the player we saw in the second half last year. I really hope this happens as he possesses as much power as anyone in the game. But there is no guarantee of that. I would like to see the Mets try Duda over there in his absence who at least has the potential to earn that position down the road. I’m sick of seeing these temporary stop-gap players come in here to play positions for a few weeks at a time, only to watch them falter and eventually be replaced by a similar player. This is the time to look at players in positions that they could potentially help this team at down the road. Any promising prospect that the Mets have at third and second base in the minor leagues should be seeing playing time at other positions, as just about anything else is up for grabs at this point. Couldn’t agree more. The Valdespin love affair is just about over with the fans. If he’s going to play anywhere with this team, it should be in the outfield. Hopefully Collins comes to his senses soon and leaves Murphy alone.